Over the past few years KRR ProStream has been delivering a variety of services at one of the UK's landmark EfW plants. This two line energy recovery facility processes 350,000 tonnes of municipal waste each year and produces 25MW of electricity that is distributed to local homes and businesses via the national grid. In September 2012 we contacted the Operations Manager of this facility to schedule one of their regular Mobile PWT cleans, which are carried out approximately every two months. As this customer makes use of our Performance Tracker service to monitor key parameters of their process, we are able to provide them with an advance warning of any potential problems and arrange the required intervention. This is one of the many benefits of the Performance Tracker service, as the potential for both unplanned shutdowns and emergency callouts is considerably reduced. In this instance we could see that the back end pressure and temperature in one of plant's two lines were reaching levels that indicated a significant build up of fouling. As a result, heat transfer and overall process efficiency were both significantly reduced. Without action being taken the situation would continue to deteriorate until the boiler became totally blocked and forced an unscheduled shutdown. Although KRR ProStream does provide a 24/7 emergency callout service to help plants who find themselves faced with this type of operational crisis, this particular scenario did not require such immediate action, as we had been able to identify the problem in plenty of time. Following consultation with the Operations Manager, we agreed that a clean was required and a three man team arrived at the plant on the agreed date. From the data available to us via our Performance Tracker service, we already knew that the bulk of the fouling was located around a particular superheater and evaporator. By focusing our efforts on these problem areas we comfortably completed the required work in one day. Most importantly, the plant remained online throughout the cleaning operation, allowing for continued generation and no unscheduled downtime. Fig 1. Graph showing pressure drops in different parts of the boiler before and after cleaning. The effects of fouling on superheater one and the evaporator are clearly visible. In the next graph, you can see with even greater clarity the immediate improvements to flue gas back end temperature and pressure that the cleaning process delivered. The static red line shows an average back end temperature observed at this facility before online cleaning was used. As it is, when temperatures approach this level it is seen as an indication that boiler efficiency has been significantly compromised by fouling. In addition to keeping plants running without interruption, the operational and financial benefits of the KRR ProStream online boiler cleaning service are many. Heat exchange within the boiler is improved, leading to optimal back end temperatures and an increased capacity for steam production. Additionally, the requirement for cooling water to moderate flue gas temperatures is reduced and ID fan power consumption is also kept to a minimum. All of these factors can act to reduce overheads and 'parasitic load' whilst increasing the revenue earning capacity of the plant via optimised generation and waste processing capabilities. Furthermore, the carbon footprint of the facility is improved due to a reduction in CO2 emissions. Fig 3. 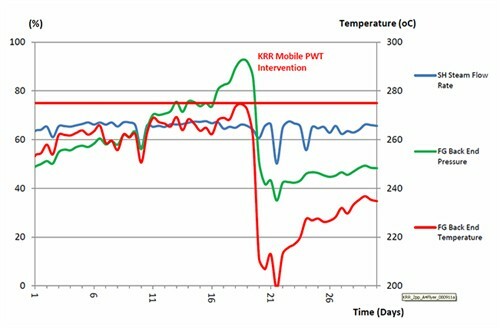 Effects of KRR Mobile PWT on use of cooling water to attenuate flue gas temperatures. Fig 4. 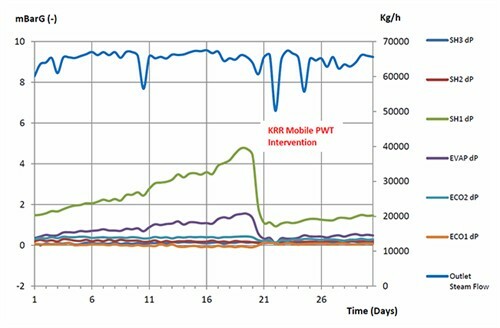 Effects of KRR Mobile PWT on generating capacity. You can see that the combination of savings and increased revenues that could be achieved amounts to more than £475,000 per year, not to mention the additional operational benefits that Mobile PWT can deliver.